We made so many (common) home buyer mistakes when we bought our first time 9 years ago. And you know what? Some of them are still costing us money.Since I’m all about showing others how to spend less and how to get more of their paychecks into their savings account, I want to share with you the most common first-time home buyer mistakes home-buyers make.Trust me – if you’re in the market for your first home (or even your second), you’ll want to pay attention to both common first-time home buyer mistakes + the ones we personally made. 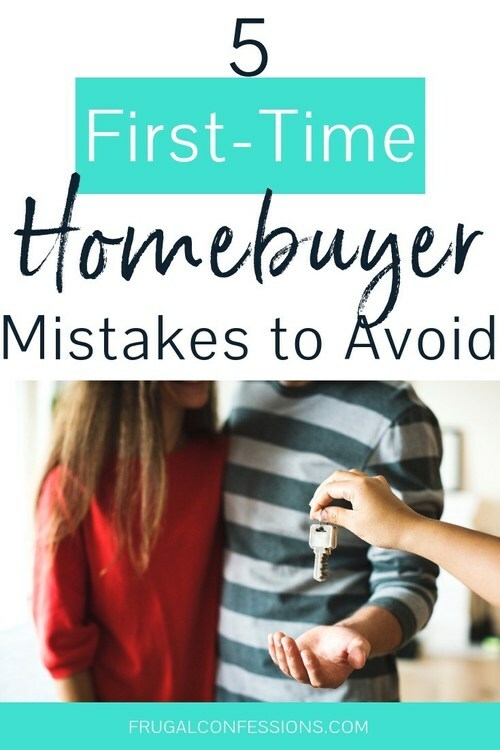 Mistake #1 : Not Vetting a Home InspectorThe home buying process – especially the first time around – is completely overwhelming.We had knots in our stomachs, we broke a sweat more than once, and we questioned ourselves along the process.Because of how lengthy the entire process is, we didn’t even think twice about who the home inspector was for our house. It was someone recommended by the seller’s real estate agent (a bit of a red flag, there), and we just went with it.To be honest, we didn’t even know you COULD shop around for a home inspector. They just made it seem all matter-of-fact, and so we just went with the flow.That simple mistake has cost us TENS of thousands of dollars over the year.This is not to say that we still wouldn’t have bought the house if we had known all the things that would need to be completely gutted during our ownership, but it could have given us a better bargaining chip to negotiate the price down (so that we COULD more easily pay for all the renovations/repairs).This includes things like:$7,000+ Foundation Repair within a few years of ownership2 new Central A/C Units and furnaces instead of the one that we thought we’d have to do (Over $11,000 for both)The entire home needs to be re-piped because it’s galvanized piping, which starts to break down at this point (we didn’t know anything about the plumbing, and weren’t told this)The back patio is made out of indoor tiles, so they get seriously slick when wet + they have mostly broken away in the last 9 years. Mistake #2 : Buying All New Furniture and Appliances. It’s very common for new homeowners to get so excited about everything that they want to deck it all out in new furniture and appliances.Here’s what I suggest you do instead: focus on buying ONE new appliance or piece of furniture, and use what you’ve got or hand-me-downs to take care of the rest.Then, upgrade incrementally as the years move on. This is one of those money saving tips that will help you in the long run.And if I were you? I would make your home splurge REALLY count, meaning make it something you’re going to use all the time.For us, this meant buying a refrigerator when we moved in. It was the only big purchase we made, and we chose it because we had mistakenly thought there was a refrigerator included with the house (it ended up being a kegerator…which leads to Mistake #3 below).And then just recently? We upgraded to a Saatva Luxury Firm Mattress – because, let’s be real, you literally spend around 8 hours every single day in your bed. Buying a new mattress is a GREAT way to feel like you’re really upgrading things.We could have bought both at the same time, but I’m glad we didn’t – we really needed that money for other things at the time. Mistake #3 : Not Thoroughly Reading Your ContractOn closing day, you will be swamped in paperwork. You might even get a knot in your own stomach – like we did – and feel like you’re signing your life away.I’m a contracts person, and so I tried my best to look over all of the paperwork being sent our way in the closing room. And I know that I read more than most, as the closing person clearly showed her dissatisfaction at the slow progress we were making.But guess what I missed? The sellers had put an asterisk in the contract saying that the refrigerator in the garage was included (I thought they meant the refrigerator in the kitchen). After closing and turning the keys to our new home for the first time, we quickly learned that they had left their kegerator “refrigerator” for us in the garage, and taken the one in the kitchen. And, yes, it was there in “plain” black and white (our realtor pointed out to us, after we called her and asked what had happened). Mistake #4 : Emptying Your Savings Account for the Down PaymentJust one month after we purchased our home, we lost our second car. It was a beater car anyway, so its days were numbered. But, did we think we’d need to pay for a second vehicle right after paying for a down payment?Nope.We ended up paying cash for another beater car, but for a few months there we were very low in our emergency savings fund.Let our mistake be a lesson to you: do NOT empty your savings account and/or emergency fund to pay for the down payment.You don’t know what issues you’re going to find in your home, or what life will throw at you once you buy your first home. So, you need to save up a down payment ON TOP OF your emergency savings fund. I hope you not only find these first-time home-buyer tips helpful, but that you follow them. Learn from our mistakes, and the mistakes of others to lose less money out of your own pockets over the years. And may your first home be a good one!